ARRA News Service: LVRJ: Obamacare "Glitches Now Haunt Nevadans At Tax Time"; Does Nevada's U.S Senator Reid Care? LVRJ: Obamacare "Glitches Now Haunt Nevadans At Tax Time"; Does Nevada's U.S Senator Reid Care? 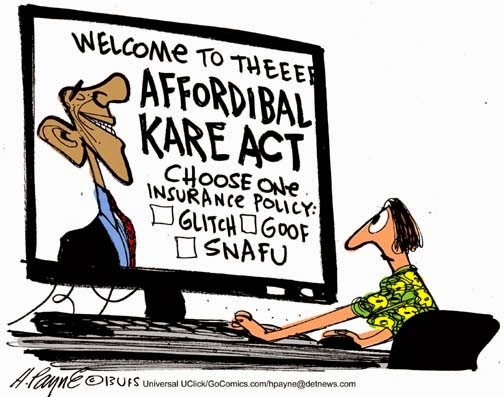 Though President Obama and fellow liberals spend a lot of time these days trying to claim that Obamacare is a success, ordinary Americans still struggle with the bureaucracy and red tape the unpopular health care law has created. Earlier this week, the Las Vegas Review-Journal documented the frustrations of Nevadans who have to navigate the problems Obamacare has added to tax season. “How did a Reno collections agent end up in collections himself? He bought coverage in 2014 through the state’s health insurance exchange. “Rick Furst is still ironing out wrinkles in a plan purchased in May through Nevada Health Link and its contractor, Xerox. His cascade of issues has included bad coverage dates, unpaid medical bills and an incorrect tax-credit form. ‘My credit was excellent, and now my credit is shot,’ he said. “Furst is one of many Nevadans still struggling with Nevada Health Link’s woes. It’s hard to know how many others have coverage or tax-credit hiccups because exchange officials say the way they track unresolved cases makes it difficult to put a number to the problem. Nor do they trust Xerox’s reports on how many unreconciled cases remain. “What’s clear is some fixes are moving at a glacial pace with a week left until Tax Day, and some consumers will run out of time. “At one point last spring, there were about 10,000 problem cases with exchange-based coverage, Casale noted. ‘Does that mean there are 10,000 1095 errors?’ he asked. Other states and the federal government had to reissue 10 percent to 12 percent of their customers’ 1095-A forms." The Review-Journal continues, “Karen said that for her it’s been slow-going. “She took the 1095-A form she received in January to her tax-preparer on Feb. 7. The two determined the form quoted the wrong coverage dates. She made nearly a half-dozen calls to Xerox’s customer-service center in February. On March 5, call-center reps told her they had finally ‘gotten authorization to review’ her problem. “She added that call-center employees told her they print corrected forms only every two weeks and send out mailings just once a month. They said her form would be mailed on March 20. . . . As of Tuesday, Karen still had a bad form. And tax issues are only part of the Obamacare problems Silver State residents are dealing with. The Review Journal notes, “Furst, at least, received his corrected form on March 31. Not all of the Reno man’s problems are fixed, though. “He paid his premium on May 23 for a July 1 policy start date. On July 3, excruciating abdominal pain sent him to an urgent-care center. But he never received member ID cards and couldn’t prove coverage. He paid $120 out-of-pocket for his care and a referral for diagnosis. On July 6, he entered a Reno-area hospital, where a test found stomach ulcers. Furst said he spent two days in the hospital on pain medicine. He couldn’t pay the $10,000 tab. “He’s personally out the $600 or so he could afford out of pocket. He’s in collections on much of the rest. He said he hopes the bills will be paid now that his 1095-A form reflects his actual July 1 start date. As difficult as Nevada's are having with Obamacare, hope they are contacting one of the bills major proponents, their own Sen. Harry Reid. Do they believe he even cares? Maybe, itwas things like Obamacare glitches that sent a clear picture to Reid that his days were numbered, Thus, his decision to nor run for re-election in 2016. Tags: Nevada, Obamacare glitches, Harry Reid, Las Vegas Review, editorial cartoon, Henry Payne To share or post to your site, click on "Post Link". Please mention / link to the ARRA News Service. and "Like" Facebook Page - Thanks!